This year, following on from our sponsorship of Southampton Football Club and the now Ryde Saints U14’s Football team on the Isle of Wight, we’ve decided to redress the balance of sexes and now sponsor a ladies netball team, based in Bournemouth, Dorset. The Blackberries are no ordinary team; Having formed only one year ago they had an extremely successful 12 months, culminating in a 2nd place finish in the league and a promotion! 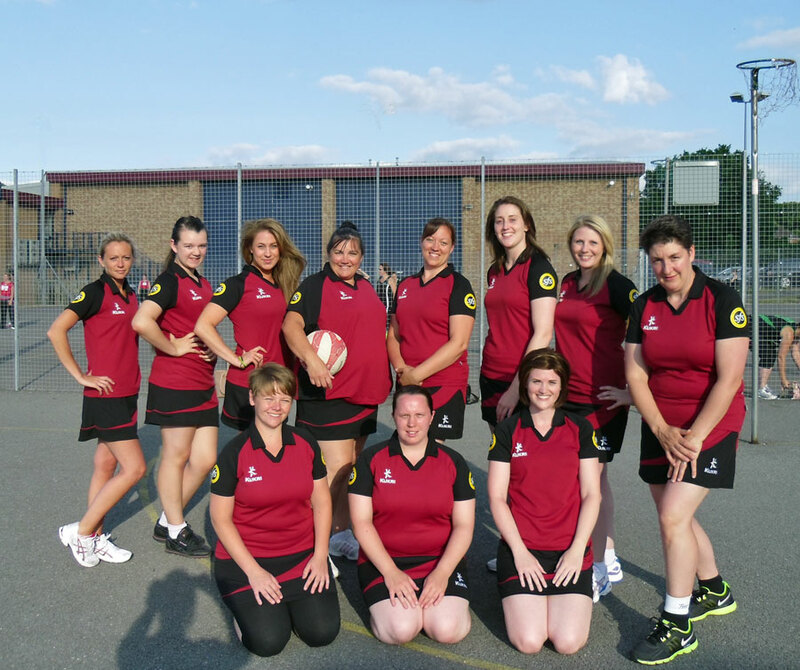 The Blackberries formed in August 2012 after meeting by chance at a Back To Netball session at the Sir David English Centre in Bournemouth. We all went along separately as a way to get fit and had never met each other before; we ended up forming a team. We only had about 5 weeks of training time together before the Winter Season started and our first competitive match. The team needed a captain and luckily we had a player that used to play for the county – Heidi Nye. We also nominated Allie Gibbs as secretary. We then needed a name. For weeks we could not think of a suitable name until before training one day we met and Heidi’s daughter, Mollie, was playing with her phone and said “how about Blackberries?” We instantly liked it and it has stuck ever since; making our team colours easy to choose: Black and Burgundy. As all started falling into place we lost one player due to commitments and another through injury at work; unfortunately Danielle Batty is still recovering but we hope to have her back soon. Thankfully Heidi managed to find a new player in Jane Ford, who has been a god send to the team with her “out of nowhere attacks” and “James Bond rolls” in defence. We started off our first season losing the first 2 games and although this was a confidence knock, we kept our spirits high and then went on to win the next 5 games. We had a tough fight and unfortunately were kept out of the top 3 positions by 1 point, leaving us a very happy 4th for our first season. We then went on to play in the American Tournament for our division and came runners up, only losing 1 game. We were a very happy team. In March 2013 we had our presentation where we received our medals for the tournament. We were ecstatic to find that Jane Ford had won the division player of the year and then Bournemouth Netball Association Player of the year. Unfortunately she was on crutches for the presentation after being injured during a training session and has not been able to join in the summer league. We are hoping to have her back for winter though. After starting the so called summer season feeling very much like winter, it has finally warmed upJ. We have spent the entire season in the top 3 positions for our division and have added a few more players after losing a couple at the end of the winter due to commitments as well as Jane before the summer breaking her ankle and Natalie with only four games to go, breaking her finger at training. On our last game of the season we were sitting in 2nd place with only 1 point between 1st, 2nd and 3rd places and 4th place not far behind either; we had to win!!! The team played a hard match and Won, 36-35 and finished the season in 2nd place. As a team we are so proud of our achievements and plan on working hard and WINNING the next season! 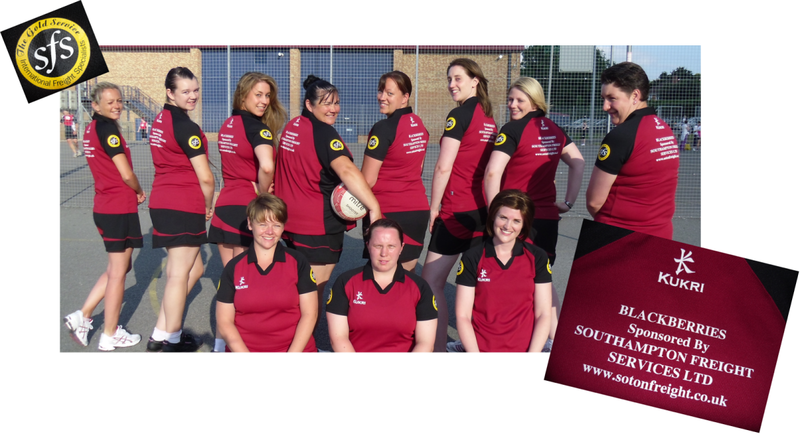 We were so happy when Southampton Freight agreed to Sponsor us and provide us with a new kit, which all the team agree is brilliant! From all of the Blackberries we would like to say a huge THANK YOU and fingers crossed you bring us luck ! No doubt the team will create their own luck this coming season, however we are very proud to be sponsoring such a determined and successful team. Good luck!